It seems oddly fitting to begin my VIFF coverage with a few shorts that hail from the country in which the festival is located. Though I saw many wonderful features, there is something congruous between these works and the low-key but still kinetic feel of the festival itself, a peculiar humble vitality that I haven’t truly seen elsewhere. Kazik Radwanski’s “Scaffold,” which premiered at Locarno to large acclaim, exemplifies this mindset extremely well. 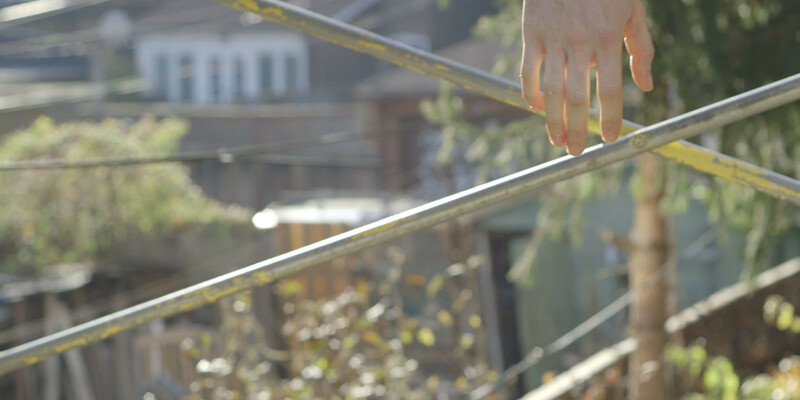 Taking place over the course of a workday, it (narratively, not visually) depicts two Bosnian-Canadian laborers working on various jobs in and out of homes around Toronto. The shooting style takes many cues from Bresson in the almost exclusive focus on hands interacting with various objects, including the eponymous scaffold, and there is a quietly optimistic tone about the whole venture. There are small dramatic moments – a dropped phone and flower vase – and some themes of class and nationality hover around the edges, but on the whole the actions are extremely quotidian. The gestures are humble but always striking, and the short knows exactly when to end, which is always a pleasure in short-form works. Most of the filmmakers associated with the Berlin School have rejected the label in some fashion, or at least questioned the label’s applicability to their work when placed in proximity to that of their peers, and given the individual ascendence of people like Petzold and Ade, who do have idiosyncratic interests that extend beyond the pre-defined set of Berlin School signifiers (a superficially televisual look, something something “the European Project,” etc.) it makes sense that artists increasingly want to claim a personal project rather than be lumped in with a brand. And critics have, from my vantage point at least, followed the filmmakers’ lead. There’s a sense that the Berlin Schoolers have graduated from new wave status, or have at least matriculated from Un Certain Regard to Competition, and ought to be taken more directly on their own terms. But then what to make of a filmmaker like Valeska Grisebach, and particularly Western, which emerged in Un Certain Regard over a decade after her last feature premiered during the height of Berlin School attention and which feels more wedded to the school than the likes of Toni Erdmann or Phoenix? To a greater extent than her more famous peers, Grisebach and her films fit right into the box: a markedly plain style of flat key lighting and un-showy set-ups, an unabashed concern about Germany’s place in 21st century Europe, and a fondness for discreet, almost imperceptible abstraction. Maison du bonheur celebrates a very French epicureanism—that old Gallic fondness for fromage, pastries, and Aperol spritzes—that seems to animate the daydreams of drab North Americans more than it does to the soul of La République in the era of Macronisme. But as with any ancient philosophy there are holdout practitioners who keep the flame alive. Canadian filmmaker Sofia Bohdanowicz’s second feature zeroes in on one such philosopher, Juliane, a sixtyish astrologer and casual gourmand who lives in the Hausmannian maison of the title. Maison du bonheur’s offhand genesis (Bohdanowicz was asked by a friend if she might consider documenting her mother, a woman that the director had never met and knew nothing about) profoundly informs its approach. Rather than cross-examining Juliane about the details of her personal history, which would be très gauche, Bohdanowicz simply observes the objects, from astrological ephemera to a well-loved KitchenAid, and the routines, largely centered on food, that comprise her everyday life. Conceived as a series of grainy 16mm insert shots, Maison du bonheur glows with Juliane’s anachronistic spirit and shares with her a deeply considered approach to things. Luxe generosity, on the part of both filmmaker and subject, defines the project; a mid-film toast to the offscreen filmmaker by Juliane and friends typifies the constant magnanimity on display. But as one mysterious detour to Deauville suggests, Bohdanowicz’s prior stay in France was significantly more troubled. Bohdanowicz’s role in the film mostly goes unspoken, save this detour and an amusing anecdote about Paris’s worst eclair, though the way that her camera watches Juliane’s hands—which are omnipresent—mold a Shabbat challah or caress an astrological chart reveal a subtle master/student relationship. During the post-film Q&A Bohdanowicz revealed that she shot the film without sync sound and crafted the film’s lush foley track entirely on her own by following Juliane’s design for living at home: recreating the challah recipe or recording a friend savoring a pastry at Juliane’s deliberate pace. Image and sound thus become a teacher’s instruction and the student’s recital, so that Maison du bonheur begins as a mere document of Juliane’s way of life and ends up as true, delectable praxis. Bohdanowicz need not say more about herself to communicate what this gourmandine education means to her, though she does make one final gesture of gratitude at the conclusion: she returns Juliane’s toast, dedicating Maison du bonheur to all those who live in this house of happiness. And with her film, she kindly opens the door for the rest of us.